Characters have always been the heart of a work’s story, representing different pieces to the author’s puzzle. These imaginary people are reflections of their real life counterparts, even if they are sometimes distorted. One of the many examples of distorted portrayals of real life can be rendered down to an issue of gender, where women are represented inconsistently. As their representations vary in comparison to their real life counter parts. Such is the case in comics, where women have been presented as sirens and mindless plot devices. This distortion is blatantly evident in comics from the Second World War. Where in E.T Legault’s Active Comics #2, female characters are presented as both progressive and helpless; independent and dependent. As is illustrated by the characters written by Legault who set boundaries, as well as break them. With Elise who breaks the boundaries set by characters like Ruth and Carole, who embody the trope of the damsel in distress, she is presented as more progressive. Highlighting how these characters are represented as enigmatic figures who remain intangible for their male authors. Women in need of saving: a synonym to the term and trope of the damsel in distress. Where typically a woman finds herself in trouble and in a situation where she needs to be saved, which is typically done so by the male hero. The trope is realized through the theme of distress, a theme that in Hedy White’s study allow him to examine the reoccurrence of the damsel in distress in children’s fiction. White furthers his point by discussing his evidence as to how such a theme is seen mostly amongst female characters, making it a gendered theme (White 251). Highlighting in his conclusion, after proving that the theme of distress is most relevant amongst female characters that the female characters under study in children’s literature tend to “reflect the cultural stereotype of the helpless female, the perennial damsel in distress in need of male protection” (White 255). Showing how a key element to the trope is the need to be saved, as they are in distress and are typically saved by a male character; a lack of independence and capability to choose. In simpler terms: they lack the agency to prevent distress. Moreover, this notion of being saved by a male character is evident in the second issue of Active Comics, whether Dixon saves Ruth from a demon, or Capt. Red holds Carole with an earnest demeanor. The images and motifs shown emphasize and emit a feeling of relief and ease, mainly due to the way that tension builds and is relieved in the comics through the characters need to be saved. The relief coming from when the reader understands the purpose of the comic’s protagonist and they have achieved their purpose, thanks to the tension being resolved. Highlighting the start to the notion of how women in comics are used as plot devices. After all, in the segment of “Dixon of the Mounted”, the main love interest: Ruth, has gotten herself into a situation in which she is helpless and in total distress. Allowing Dixon the chance to save Ruth multiple times from the demonic figure. The imagery being very cinematic, emphasizes Ruth’s helplessness, specifically on one page where there is a panel of her tied down to a rock, followed by her crying in Dixon’s arms (Legault 24). Allowing the audience to start to understand the level of distress emitted by Ruth, and how gendered roles are starting to develop: man as a hero, woman as a helpless dame. Fig.1 E.T. Legault. Panel from “Dixon of the Mounted”. Active Comics, no.2, March 1942, p.24.Bell Features Collection, Library and Archives Canada. In “Capt. Red Thortan”, Carole is a typical damsel in distress. Specifically when the character is rescued from being tied-up in a Japanese camp, and is then constantly being aided by the titular character. However, after the characters escape, the frame that lends itself to evoking the trope is when both Red and Carole fall into a trap, and Carole flails her arms into the air while Red remains steadfast. It represents the trope in its entirety due to the comparison between the characters. Even if it is a slight, but major, detail of Carole flailing her arms. The point remains that the character is helpless, whereas Red remains prepared and ready for the trap as her braces himself (Cooper 47). Even if this may be a stretch, it adds to the notion established by White, in the way that Carole is helpless and is visibly in distress. Commonly, both Ruth and Beverly affirm the presence of the damsel in distress trope, as the characters embody a repetitiveness of being saved by their narratives male hero. One could say that the characters create a motif of sorts, in the way that the imagery highlights their helplessness. Whether it is sharply angles that emit tension with Ruth being tied down to a large rock (Legault 24), or the frame in which Capt. Red stares at Carole—who looks relieved (Cooper 46). 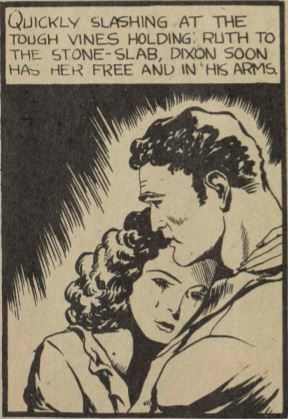 Themes of the damsel in distress remain relevant in the visual aspects of the comic. Solidifying how, in similar terms to that stated by White, the trope of the damsel in distress is a blatant stereotypical stamp on the representation of the female gender whose sole purpose is to propel plot and story (White 255). Seeing how the second issue of Active Comics was published in 1942, it is fair to say tensions were not only high on the battlefront, but also on the homefront. In a 1942 Globe and Mail article discussing new volunteer centers on the Canadian homefront, and specifically how the centers will “insure proper co-ordination of effort and give all volunteers an opportunity to help where they are most needed” (“New Volunteer Centre Setup” 1942). Framing the need for help on the Homefront, which is furthered by the director of the volunteer service, W.E. West, who says “there is a war to be won on the home front, and misdirection and overlapping can be just as tragic at home as on the battlefront” (“New Volunteer Centre Setup” 1942). Emphasizing the need, and the responsibility that women occupy on the Homefront. In addition, in the segment of “The Brain”, female characters start to distance themselves from the tropes set by Ruth and Carole, and start to embody characteristics of their real life counterparts. Such is exemplified by Elsie, as the character takes charge of her situation—not becoming victim to it. Reason being that the character ignores all of the advice given by the protagonist, and goes after the antagonizing mafia—fighting battles and trying to bring them to justice. Elsie is an example of not abiding by the dominant, male character. Due to the way that the character, unlike Ruth and Carole, is not undermined by the Brain: the protagonist of the narrative that she partakes in. Rather, Elsie starts to break through the barriers of what Ann Larabee, with the help of Scott McCloud, described to be the “phenomenological representations of the body” (Larabee 2016), which so happen to be the confines that Ruth and Carole abide to. Alluding to the way that women are represented with over exaggerated hourglass figures, and their overly blemished faces that all lead to the characters vulnerability in the story (Larabee 2016). According the McCloud, this form of representation is unrealistic as it does not allow for women to go through “the experience of not being able to see one’s own face” (Larabee 2016). Highlighting the broader effects of a female representation that the damsel in distress trope emits, and which Elsie seemingly does not take part in. However, in relating the last point with the way Elsie is illustrated, we can see how the character embodies the phenomenological issues of representations. As Elsie has accentuated hips, and a blemished face that accentuates her embarrassments, which is seen when she falls into the mafias trap (Bachle 60). This points towards to how Elsie can be seen as the prototypical damsel in distress, as she embodies themes of distress. Nonetheless, the character remains independent—overshadowing themes of distress to embody an independence not found amongst the other character. Resulting in what we call a progressive dame: an independent, resilient, realistic character. Progressive Dames and Damsels in Distress: Enigmatic Figures? In his critique of Scott McCloud’s definition of comics, Aaron Meskin focuses on McCloud’s idea that comics in their use of images and words allow the panels to “convey information and/or produce an aesthetic response in the viewer” (“Defining Comics” 2007). Meskin also pinpoints how as a critical thinker, and reader, we should not be presumptuous in assuming an author’s intention, which is extremely valid as it does not allow for any pitfalls of the sort. However it is also valid to assign meaning to the images and texts seen in comics. Its validity can be directly linked to sociological theories such as ethnomethodology, where a person’s interaction with an object is tied to its context (Dennis 2011). Meaning that the interaction relies on the time, and other varying factors that surround the context of its consumption (Dennis 8). All of which allows us to understand how readers begin to understand and correlate representation to actuality. For example, in understanding the context around the publishing of Active Comics we comprehend the blossoming responsibilities given to women on the Homefront. Responsibilities such as partaking in the work force, reinforcing military munitions, and developing medical treatment—all while boosting morale and proving that women can balance work and home life (Haws 1940). Evoking images of a more progressive and rightful role for women, which can be seen as an unpopular opinion. As the only reason why these roles were thrusted upon them was due to the absence of a male presence, which ignited insecurity among majority of the men, who were the voice of the media (“Equal Rights Has Dangers” 1945). Similarly, there is a frame in the comic where Elsie saves the Brain (55). Solidifying how, through her likeliness of women on the homefront, Elsie is a progressive dame. Raising the point of women as enigmatic figures: as their representation is inconsistent with the values on the homefront and the comic. Contextually, the independence that Elsie demonstrates mirrors a distorted freedom that women on the homefront gained from an entry into the workforce. Simply due to the way that they seize the chances that come across them, to help the war effort any which way they can. Compared to Ruth and Carole who do not seize that same opportunity, falling victim to their non-existent independence. Allowing Elsie’s independent characteristics to be bolstered and emboldened in comparison. Emphasizing how women, for male writers, are enigmatic figures whose representation is inaccurate without a strong feminist voice behind it. As it leaves room for female characters to fall into tropes like the damsel in distress. Fig 2. Leo Bachle. Panel from “The Brain”. 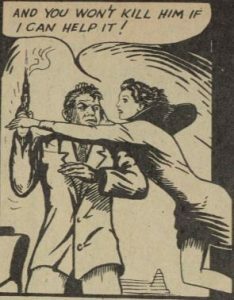 Active Comics, no.2, March 1942, p.55. Bell Features Collection, Library and Archives Canada. Throughout the paper we have seen how women have been represented as both damsels in distress and Progressive Dames, embodying two extremities: one representative of the comic’s context, the other not. Through our analysis of the comics, ranging from the accentuated figures to the independence that only pertained to Elsie, we have seen how these characters are hypersexualized by their male authors and not reflective of their real life counterparts. With only few example that are exempt to such. Affirming the notion that they are enigmatic figures, in the way that they remain ambiguous in their characterization. Through the way it is prevalent that majority of the comic’s characters fall under tropes such as the damsel in distress. Portraying women to readers, as helpless and in need of saving; with a lack of independence, which muddle their real life independence presented by the progressive dames. This goes to show how women are intangible for the reader as much as they are for the writer. Accentuating how the female characters, written by men, are elusive for the writers just as much as they are for the audience. Braddock, Paige. “Women in Comics.” Phi Kappa Phi Forum; Baton Rouge, vol. 84, no. 3, 2004, pp. 22–23. Conrad, Dean. “Femmes Futures: One Hundred Years of Female Representation in Sf Cinema.” Science Fiction Film and Television, vol. 4, no. 1, Apr. 2011, pp. 79–99. Dennis, Alex. “Symbolic Interactionism and Ethnomethodology.” Symbolic Interaction; Hoboken, vol. 34, no. 3, Summer 2011, pp. 349–56. ProQuest, doi:http://dx.doi.org.ezproxy.lib.ryerson.ca/10.1525/si.2011.34.3.349. “‘Equal Rights’ Has Dangers.” The Globe and Mail (1936-Current); Toronto, Ont., 8 Aug. 1945, p. 6. “Government Booklet Describes New Volunteer Centre Setup.” The Globe and Mail (1936-Current); Toronto, Ont., 20 July 1942, p. 10. Hawes, Stanley. Home Front. Columbia Pictures Canada, 1940. www.nfb.ca, https://www.nfb.ca/film/home_front/. Larabee, Ann. “Editorial: Teaching Young Women the Comics.” The Journal of Popular Culture, vol. 49, no. 2, Apr. 2016, pp. 247–49. Wiley Online Library, doi:10.1111/jpcu.12412. Legault, E. T., et al. Active Comics: No. 2. Edited by Bell Features and Publishing Company, vol. 2, Commercial Signs of Canada, 1942. White, Hedy. “Damsels in Distress: Dependency Themes in Fiction for Children and Adolescents.” Adolescence; Roslyn Heights, N.Y., vol. 21, no. 82, Summer 1986, pp. 251–256.